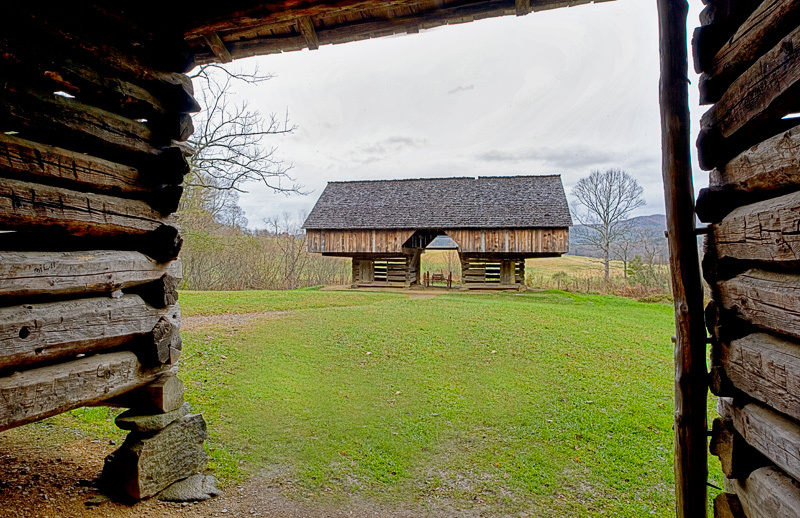 The picture above is from the Tipton Homeplace in Cades Cove in the Great Smoky Mountains National Park. It’s a great example of the vernacular architecture known as the cantilever barn. The style of hanging a large upper loft area over two cribs below is unique to the area in and around the Smoky Mountains during the late 1800s and early 1900s. 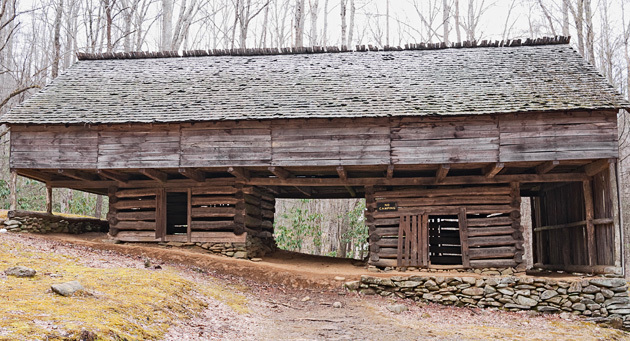 Of just over 300 of these barns known to have existed, about 290 were in the two Tennessee counties bordering the Great Smoky Mountains. To me, this style of barn architecture reflects the Appalachian mountain peoples’ clever and practical solutions to everyday problems. In this case, the climate around the mountains was very humid, which presented a challenge to keep the hayloft dry and mold-free. Solution: air circulation between the loft and the moist ground. The example below is a modified cantilever, with supports on both ends. This is the John Messer barn along the Porters Creek Trail in the Greenbrier section of the Great Smoky Mountains National Park. It stands near the historic Smoky Mountains Hiking Club cabin. On your next trip to the Smokies please stop in and visit me to see the complete display of Smoky Mountains Photos at the William Britten Gallery in Gatlinburg, TN.